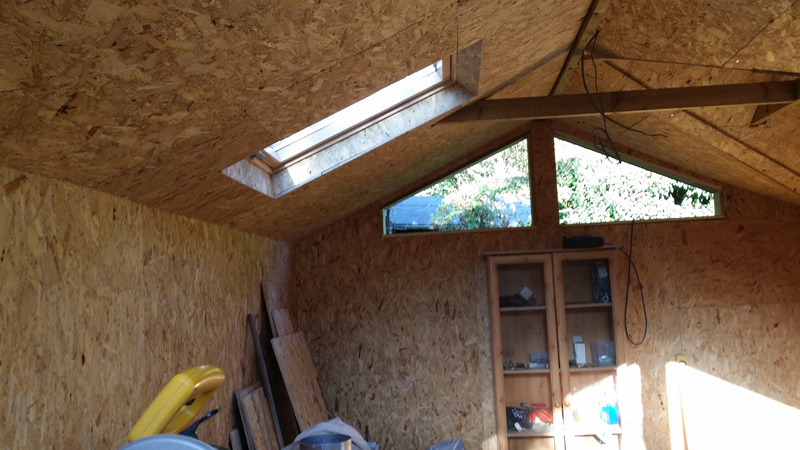 Shed Conversion Project – Finished! Firstly apologies for not posting for a while. 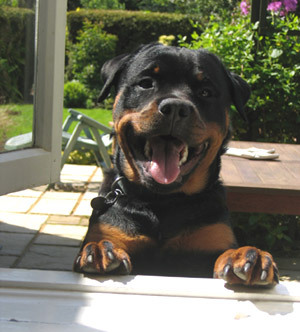 We lost our lovely dog Elsa to old age and just haven’t felt like doing much to be honest. Didn’t expect it to hit us quite as hard as as it has. Rest in peace, my dear old friend. 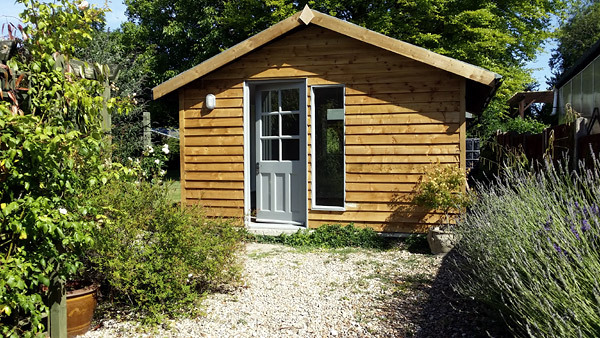 Had a week off work last week which meant we were able to finish our latest building project, converting the original workshop into a home office. Last job was to bring the carpet guys in I have to say its looking great. So pleased we made the decision to create a separate office away from the house. 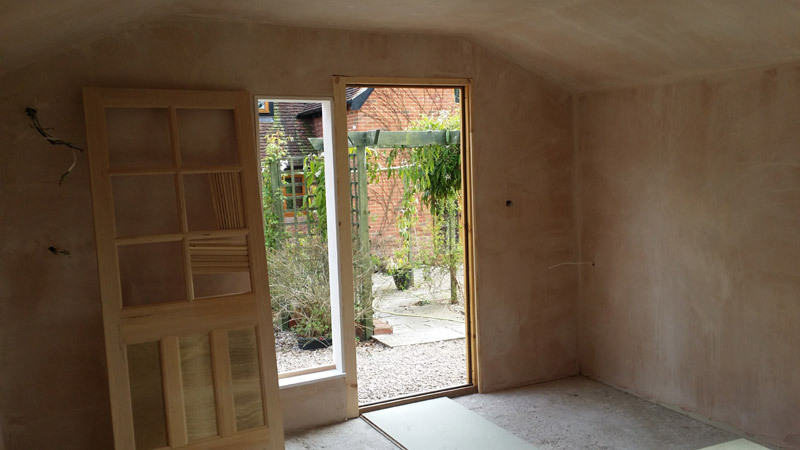 The build was fairly straight forward and took around 15 days in total to complete. The old structure was fairly solid, but we did need to beef up the walls with extra studs to support the addition of the windows and moving the entrance. 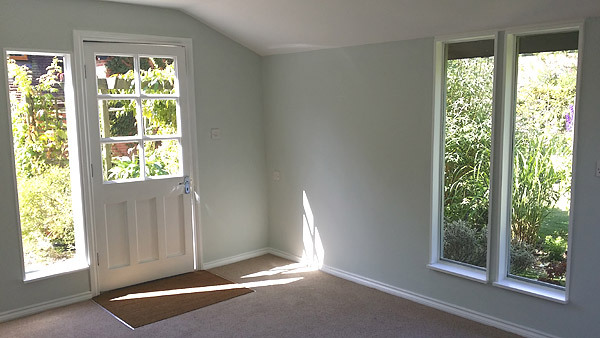 The cost of materials approximately £600 as we had to buy 6mm laminated glass for the new windows and glass panels for the door. 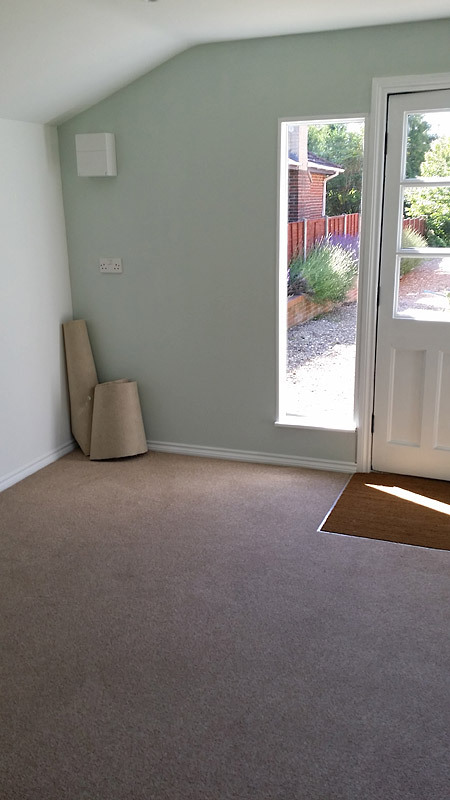 The plasterer was £350 and the carpet came in at £360 including fitting. 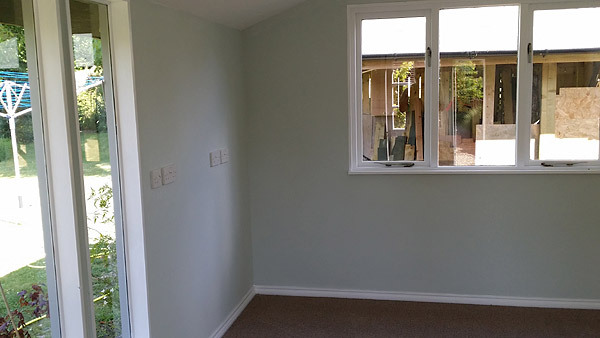 The total cost of the conversion approximately £1,500. More than we wanted to spend to be honest but we’ve managed to create a nice space that’s comfortable and secure and will make a great office to launch our new business .. more on that next time. If you’d like to know more about the conversion please feel free to drop us a note and we’ll be happy to share the details.We hope to post some plans as we’ve had so many requests. It’s just finding the time with so much going on. Phew its soooo hot today … The temperature reached a crazy 29 degrees this afternoon and they say it’s going to head past 30 degrees tomorrow! Mad times indeed. BTW … Cut our first cucumber today. 🙂 Delicious! Hope you manage to stay cool in your garden this week wherever you are. February is around the corner! Summer 2014 .. seems like only yesterday! 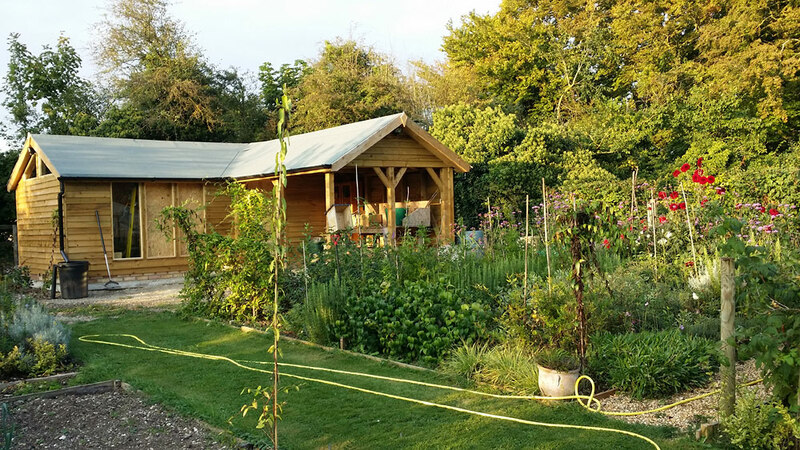 Well here we are in 2015 and I can’t believe we are into our 6th year of the ruralgardener blog and so much has happened in that time and as I sit here gazing into my crystal ball it’s looking like another busy year ahead. But before we look at this year I’d like to reflect on last year. 2014 was a good year for John and I. We stayed fit and healthy (most of the time) and had plenty of laughs along the way. Tania had a big birthday which we celebrated with a lovely summer garden party which will stay in the memory for some time … not least as the weather was so kind to us. 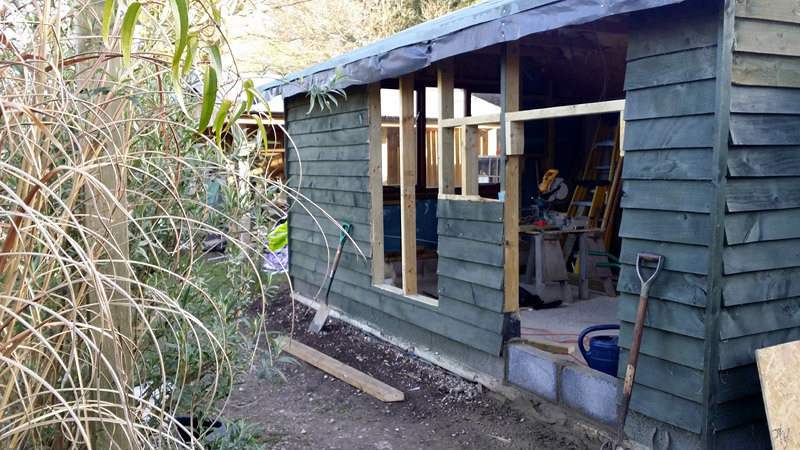 Looking at last years projects I guess the most ambitious has to be the new workshop and adjoining potting area John built through the summer. I think it took us both by surprise just how long it took to build. We started in March and I think it took just over 4 months of weekends and a chunk of our holiday to complete the project. Having said that the results were well worth the effort. It looks as if it was always meant to be there! 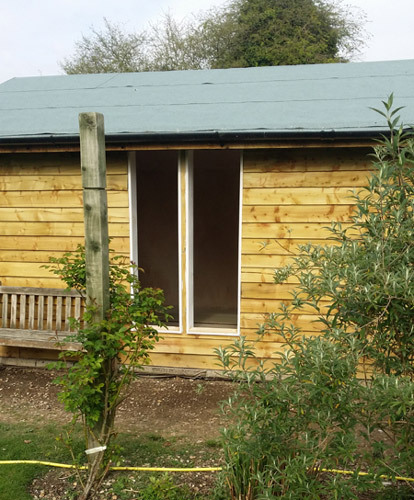 It’s given us a great base for the plant nursery and gives John a decent workshop to indulge his passion for making things. Lucky boy. We finally managed to find a weekend to lop the 20ft leylandiis that have been a pain in the backside for so long. Always amazes me just how fast they grow. They were under 8ft when we first moved in 6 years ago and we just didn’t keep on top of them. My advice is to plant a hazel hedge. Much easier to manage, fast growing and make great sweet pea supports. Anyway we minced all the trimmings and the resulting mulch is now providing a cover for the parking area adjacent to the new workshop. Should last a while and it was all free. We like free we do. 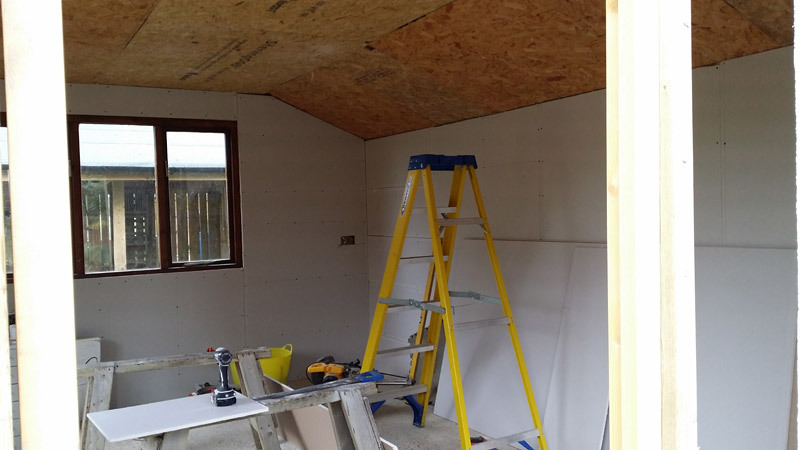 In 2014 the DIY blog posts proved popular so this year we’ve decided to create a section on the blog dedicated to building projects. 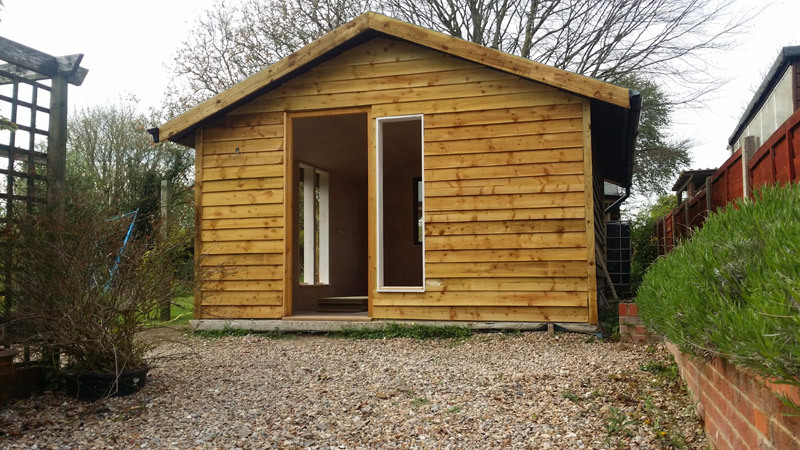 We’re planning to convert the original workshop into an office which will enable John to work from home a lot more which is a goal we’ve been chasing for a while. We’re aiming to kick off the project in February and will be posting details. Expand our YouTube channel to include regular gardening support videos and a few other gems we have in the pipline! An area where readers can purchase plans for our projects (the single most requested item on the site). 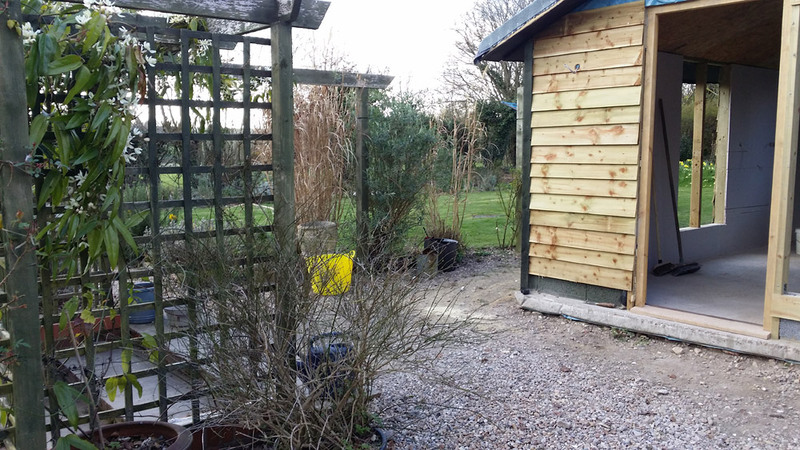 We did consider offering the plans for free but to be honest they take a lot of time to produce and so we thought asking for a small contribution would be ok.
A few tips for making a little extra money from your garden. It’s not for everyone but given our plant nursery posts are the second most requested on the site we thought we’d share more. 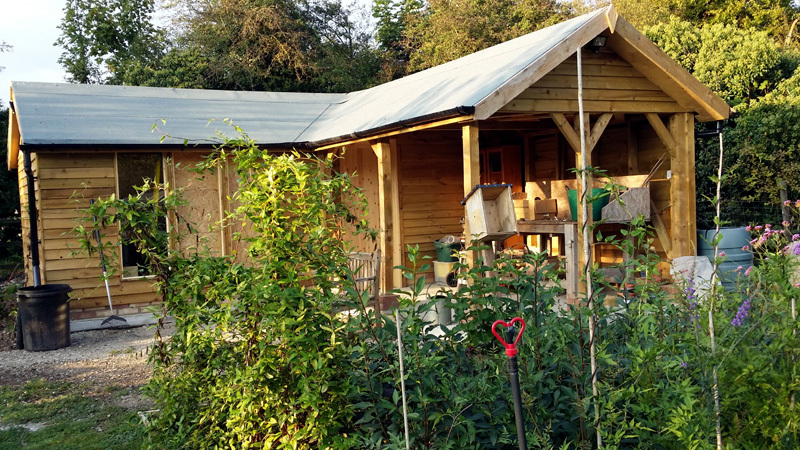 Our most ambitious plan is to hold a few open days for anyone that might be interested in learning how to start their own gardening projects. We’re also planning to hook up with some of the local schools and offer details on the site of which have yet to be worked out. If we could inspire a few young people to start gardening that would be absolutely fantastic. 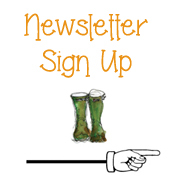 As always we welcome any suggestions for content that you’d like to see on the site so do please keep those emails coming and we’ll make it happen. We’re really looking forward to this year and guess what … it’s February next week! A slightly late but very well intentioned happy and prosperous new year to one and all! I make no secret of the fact that we both absolutely love Christmas. Everything about it from welcoming the family back for a feast of fun and merriment to putting up the Christmas decorations. A Christmas without decorations is unthinkable in my view … but they don’t have to cost the earth. We were in John Lewis a few weeks back and spotted a delightful wooden Christmas tree made from what appeared to be scrap wood. So it got me to thinking I might have a go at making my own by recycling an old pallet I had hanging around. On closer inspection the wood was sound and was weathered over time to a silver patina … a bit like oak when it’s been exposed to the weather. 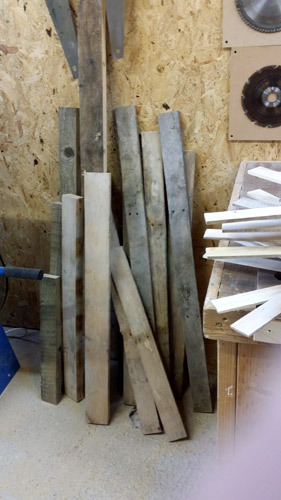 If you want to have a go at making your own you’re going to need a regular old palette which you can pick up from your local builders merchant or building site. Most builders I know are more than happy to get rid of them. But do ask as some have to go back to the suppliers. You’ll also need a length of 1\2 inch dowel approximately 30 inches long which you can get from any of the major DIY stores. This is for the stalk that runs up the middle. You’re also going to need a few basic tools like a hand saw (table saw would be quicker) some regular wood glue, a drill and a large drill bit capable of drilling a hole to take the dowel. The construction is pretty basic. All you need to remember is this is shabby chic which basically means it doesn’t have to be perfect, in fact we’re looking for anything other than perfect. It really doesn’t matter in which order the pieces are made. This is how I approached the construction of my tree. Prepare two pieces of timber 1.5 inches by 1.5 inches by 18 inches for the stand of the tree. Draw a line from the mid section we marked earlier to this mark. This should produce a gradual taper. Do the same on all four ends of the stand and you’ll have a nice taper on all four sides. Cut a half lap on each piece making sure you cut on the top of the stand and not on the bottom as I did with my first attempt! Next drill a hole in the centre of the top section of the stand ready to take the dowel and glue the two pieces of the half lap and leave to dry. Prepare the branches by sawing a series of strips about an inch and half wide and approximately 3mm thick. The longest lengths are 24 inches and the shortest at the top are around 3 inches. You don’t need to be too accurate just so long as you make plenty of branches as you’re going to need around 30 pieces in total. Also bear in mind looking at the tree the branches get shorter as you make your way up the tree. To make it easier I made a triangle template from MDF of the shape I wanted and used this as a guide for the width of the branches. I then took each strip and cut it to the width of the shape. Each section has 3-4 branches and is separated by a small spacer. 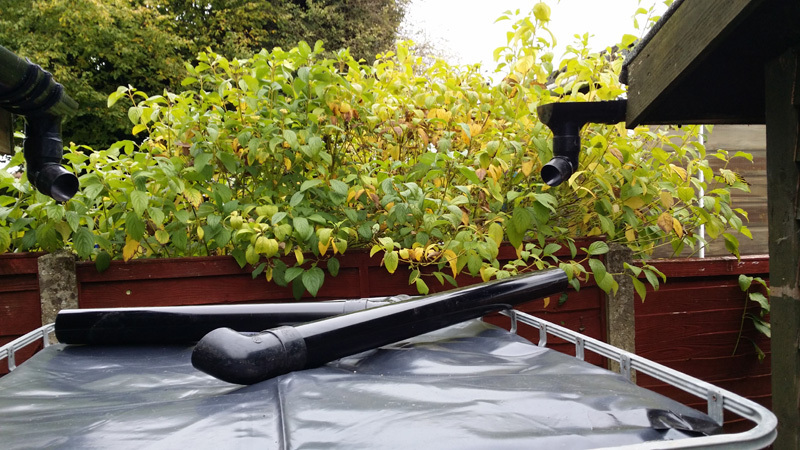 Also another tip is to make plenty of spare branches! Find the mid point of each branch and drill a half inch hole through the centre for the dowel. 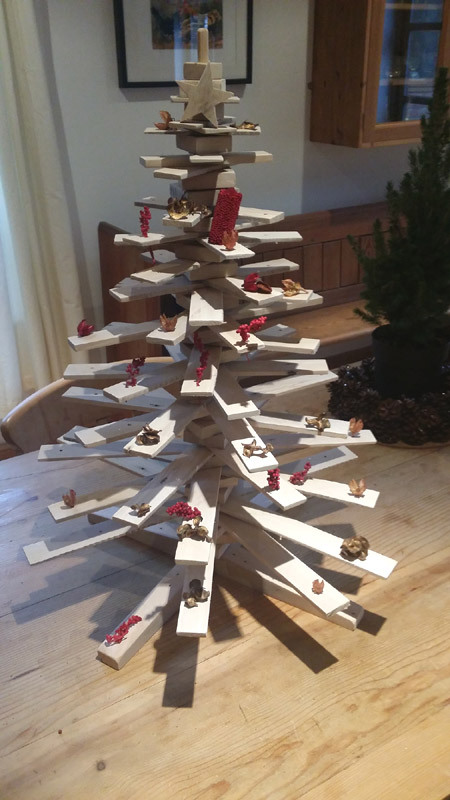 Now the fun bit … start building your tree by simply sliding the branches and spacers onto the stem in whatever configuration you fancy. Finally finish your tree with a little white paint to give it that Chrismassy feel, or alternatively you could leave it natural. As you’ll see from the pics I rather over did it with the spray can and wish I’d left more of the wood natural. I’m going to make another one and the plan is to leave it natural. Hey presto you have your own shabby chic Christmas tree! And all from an old redundant palette. Not bad eh! If you fancy having a go please send us your pics as we’d love to see how you get on. 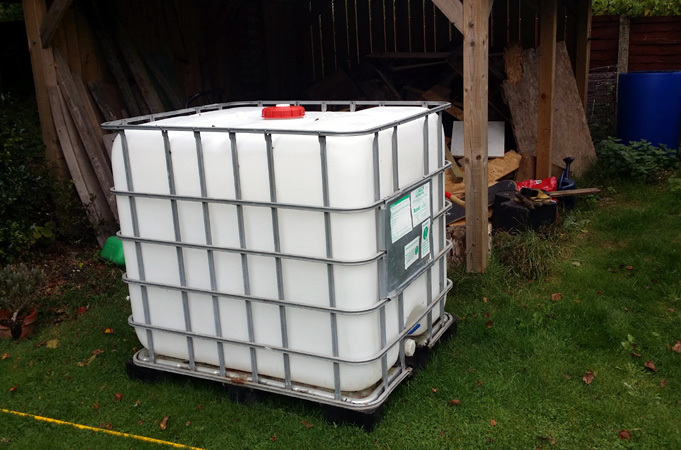 I’ve been looking to improve my rainwater collection system for a while now and I thought I can’t go into another winter without a longer term solution. Yes we have a few tanks around the place and they work just fine but they tend to fill up fairly quickly which means our capacity is limited. 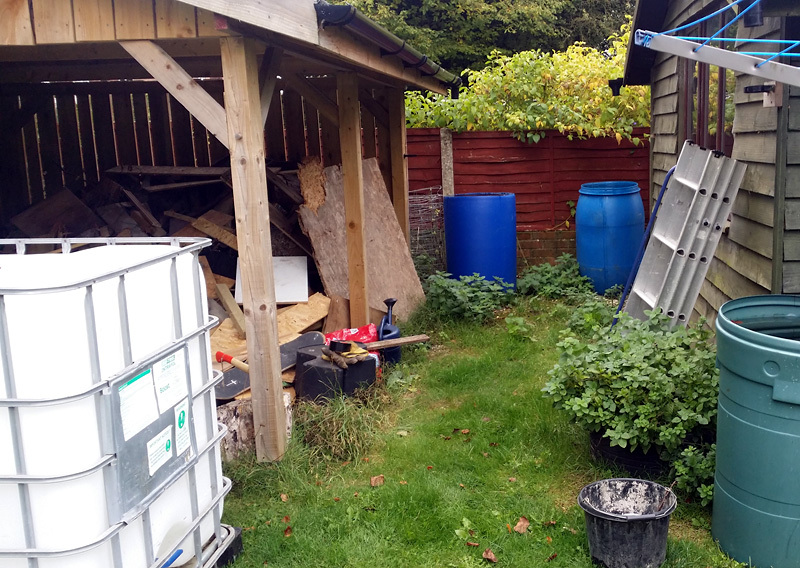 While I was doing my research I came across a few videos on where other gardeners use huge white plastic containers in a metal cage for collecting rainwater. I’ve since found out they are called Totes although I think there is another name for them. We put the word out and my brother in law who works on a farm came good! He told me they they were selling off a couple of second hand totes and was I interested. Oh yes! 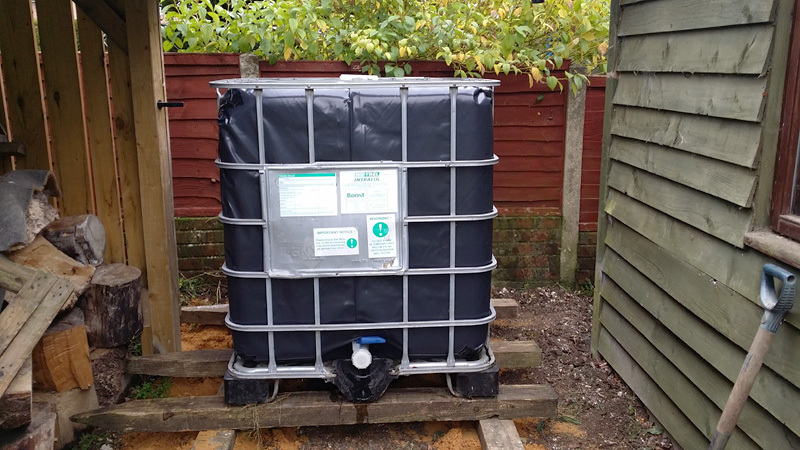 They arrived last weekend and they are perfect for collecting rainwater. I gave them a good wash out with a little general household detergent to remove any lingering fluids and they were as good as new! I’d read somewhere its a good idea to either paint them black or cover them in black plastic to stop the sun from turning the water green. 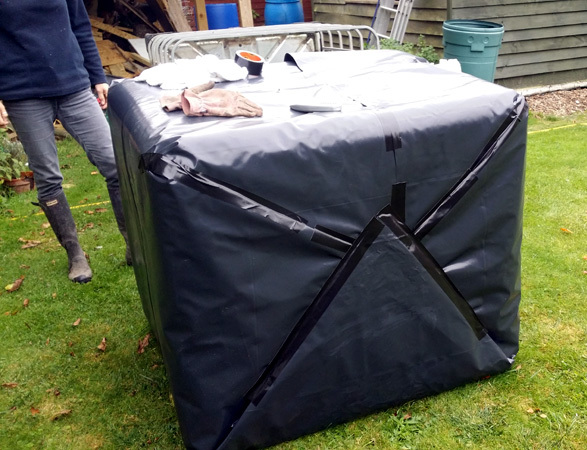 So off to YouTube I went to see if anyone had done the same thing and I found a guy in the US called LDSPrepper who has a series of videos explaining in great detail how to prepare a tote for rainwater collection. Huge thanks to LDSPrepper for such an insightful set of videos. Basically you remove the plastic bin from the cage and wrap it up like a Christmas present. 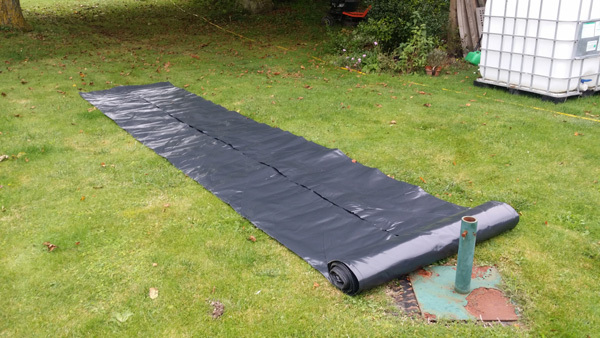 I bought black plastic damp proof membrane from my local building suppliers which comes in a long roll. I’d used it before and I know it’s really strong and it should last. The totes we used measure 48 inches by 40 inches by 40 inches. To cover a single tote you’ll need a sheet of plastic 14 feet long by 10 feet wide. Wrapping totes in this way is not difficult but if you’re thinking of having a go ask a friend or partner to help as two people make light work of it. Also invest in some strong adhesive tape. I bought some black Gorilla tape which I found at my local DIY store. Not cheap at £6 a roll but really good stuff. 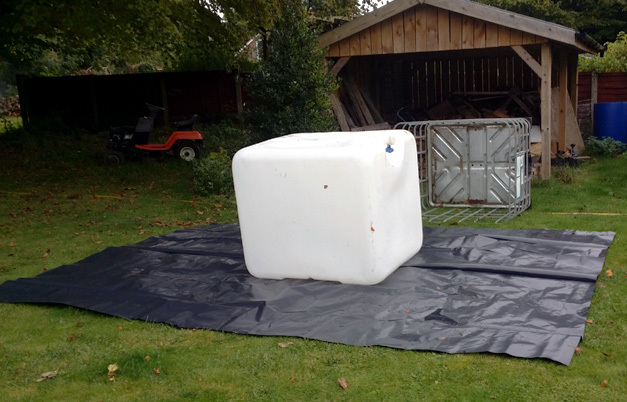 Lay down the plastic sheet and position the tote in the middle. Next lift the back half of the plastic over the back half of the tote and align at the half way from the back of the tote. I should have said earlier … it’s worth having a dry towel or rag handy to dry off any damp on the tote so the tape sticks properly. When the two back corners are complete fold the front side up over the top of the back side and fix with tape. As with the first side fold the plastic in as tightly and neatly as you can in the corners and fix with tape. Finally fold up the pointy end pieces that are left on the sides and secure with the tape. It really is just like wrapping up a giant Christmas present. When the tote is all wrapped up simply slide it back into the cage and you’re done. Finally make a hole in the plastic for the cap and position the tote where it can have the maximum effect. I’m using one in the nursery to collect from the new outbuildings and the other to collect from the workshop nearest the house. Final job was to stretch an old pair of tights over the hole. Low tech I know but it works. Total cost somewhere in the region of £80. I didn’t think that was too bad for a pretty snazzy looking rainwater collection system. If you’re thinking of doing the same sort of thing I urge you to take a look at this series of videos from LDS Prepper that explain all. I’ll take a few more pics of the completed set up next weekend. 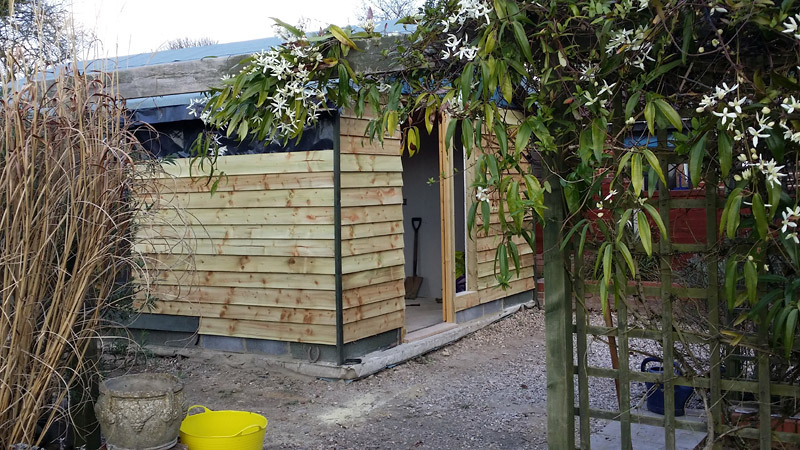 How To Build Your Own Outbuilding – Finished at last? Phew! 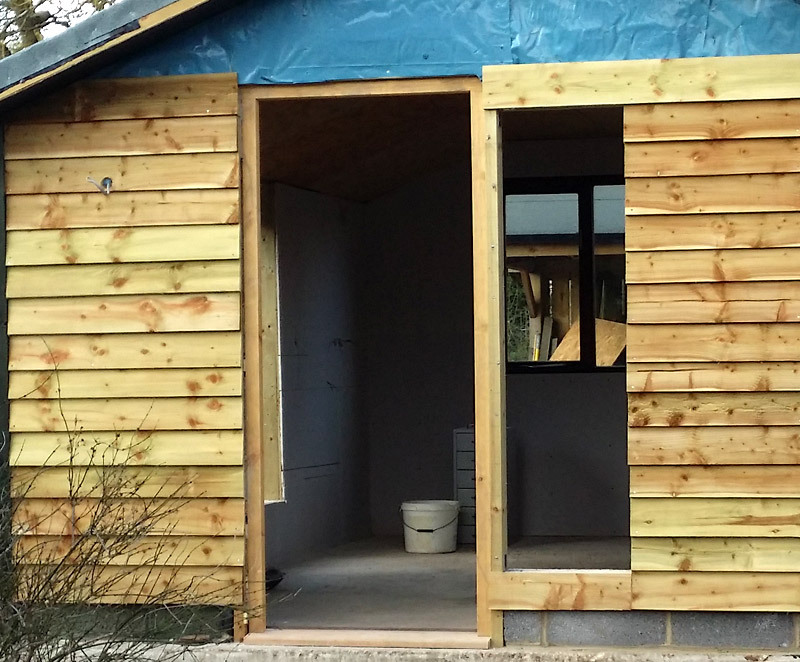 … At last we finished the new outbuilding, well almost. It was all going so well until Saturday afternoon when things definitely didn’t go to plan! 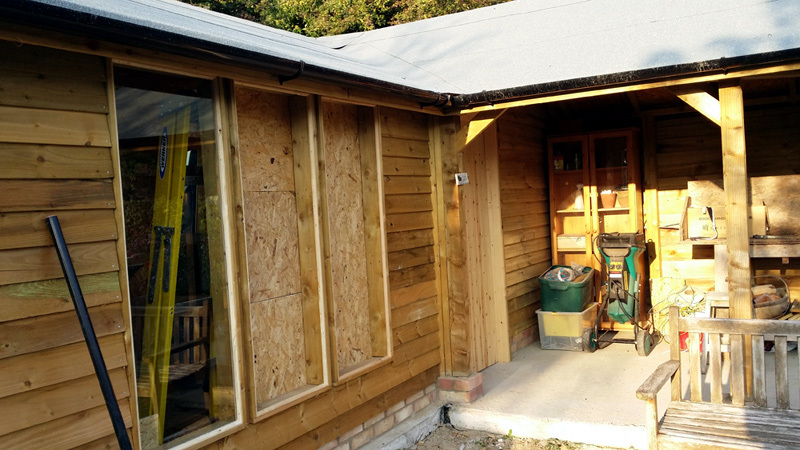 For those that follow the blog you’ll know way back in March we decided to build new timber frame working space that would double up as a workshop and potting shed for the new nursery business. The plan was to complete the build in time for the growing season, but I had no idea it was going to take so long. With John working in London 5 days a week we only had weekends which is fine except as amateurs it takes us much longer as we’re learning. 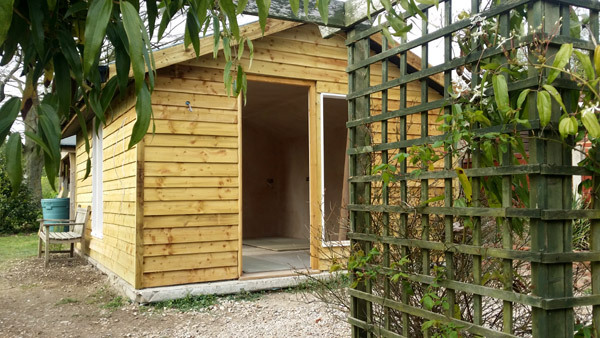 We build all our outdoor structure using a frame of 4″ x 2″ treated softwood (from local builders merchants) which is clad on the inside with OSB sheet and on the outside with 6″ treated feather board. 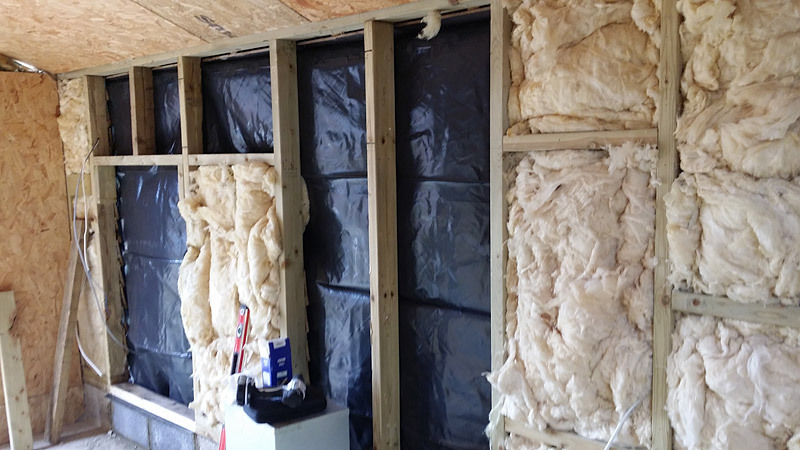 Insulation is glass fibre blanket as we had a couple of rolls left over from the house build (nasty nasty stuff …the sooner it’s banned altogether the better). 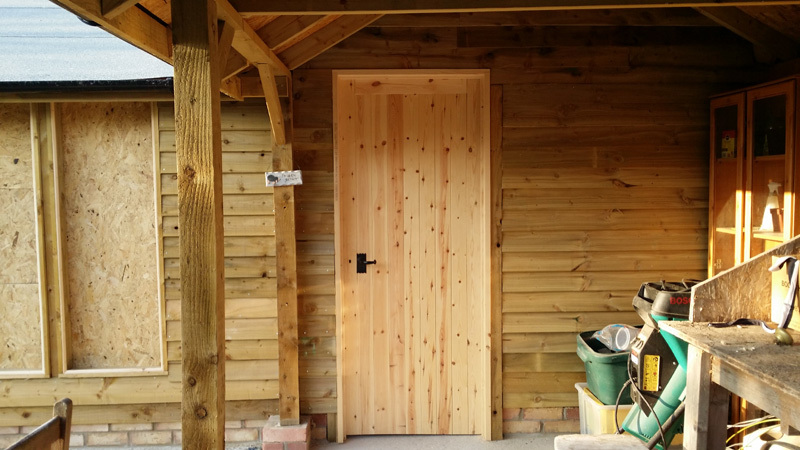 We bought a fairly cheap standard door made from pine which should last a good few years. It’s actually under the roof space and protected from the rain so providing we look after it it should last for years. The very last task on the build was to fit all the glass. So with the weather set fair for the weekend we planned to finish the project. We were advised to use laminated glass for the larger pieces at the front as the height is pretty much floor to ceiling and it wouldn’t be safe to use regular glass. Everything was going so well, the weather was good, in fact it was like mid summer on Saturday afternoon. I fitted the first sheet no problem. 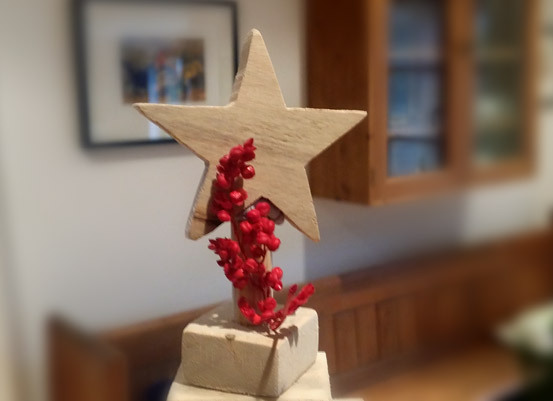 I used putty and chamfered wooden bead that I’d prepared in the workshop to save some cost. The next 30 seconds will live me forever. I can’t even remember what I was doing but somehow I managed to catch one of the other two remaining pieces. In what felt like slow motion as one pane fell face down on the solid concrete floor catching the other remaining piece on the way down. CRASH!!! Both pieces hit the floor with the most painful crashing sound. 😦 My worst nightmare had been realised. Two sheets of laminated glass at a £110 each lay on the floor smashed. A few choice words later I quickly realised there was nothing I could do. The damage was done, I’d learned a very expensive lesson. I wiped away a tiny tear and got on with clearing up the resulting mess. At least I now know the guy at the glaziers was right … laminated glass does only crack, I can vouch for that! At first all I could think about was how costly a mistake this was but later in the day I realised how fortunate I was not to be anywhere near the glass at the time as I feel sure I would have tried to catch it from falling which doesn’t bear thinking about. If you ever have to fit glass into a building or perhaps you’re fixing a broken pane in your house my advice … store the glass well away from the area you’re working. Had I done so then I’d be celebrating closure on a new project. Instead now I have two pieces of OSB sheeting where there should be 2 panes of beautiful laminated glass. 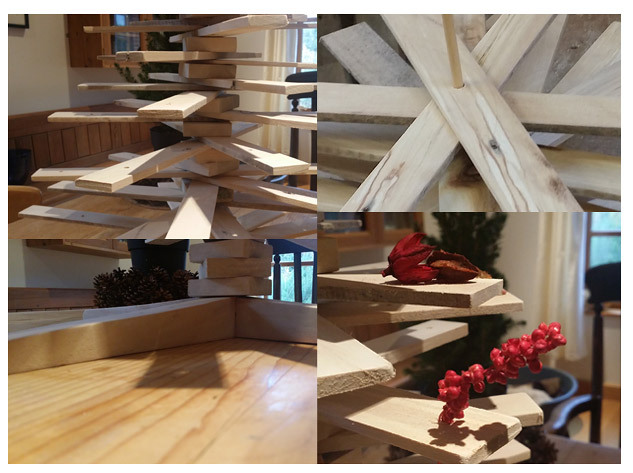 We plan to post a special feature on constructing your own out buildings which will have all the details of the materials and construction methods used and some great tips we’ve learnt along the way. In the mean time any questions do let us know and feel free to leave us a comment. Weekends seem so short don’t they.